Over the past month, I joined the many garment sewists who take part in #memademay. I wore at least one handmade garment each day and only missed a few days documenting it on Instagram. I am SO GLAD that I was able to participate this year because it showed me the holes in my wardrobe and helped me to come up with a good plan of what I need to sew more of. It feels good to be more focused in my sewing time. The first thing I added to my "to-sew" list is woven tops, specifically woven sleeveless tops since I am in Texas and summer is quickly approaching. I really love working with and wearing woven fabric. When I saw the testing call for Itch to Stitch's newest pattern, the Crystal Cove Cami, I quickly signed up and knew it was a perfect addition to my summer wardrobe. 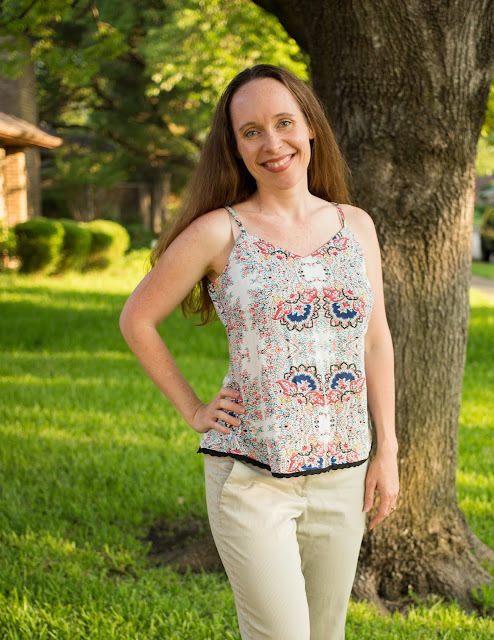 This cami is so airy and comfortable to wear. I will just go ahead and cut to the chase: You are going to need several of these in your closet too. 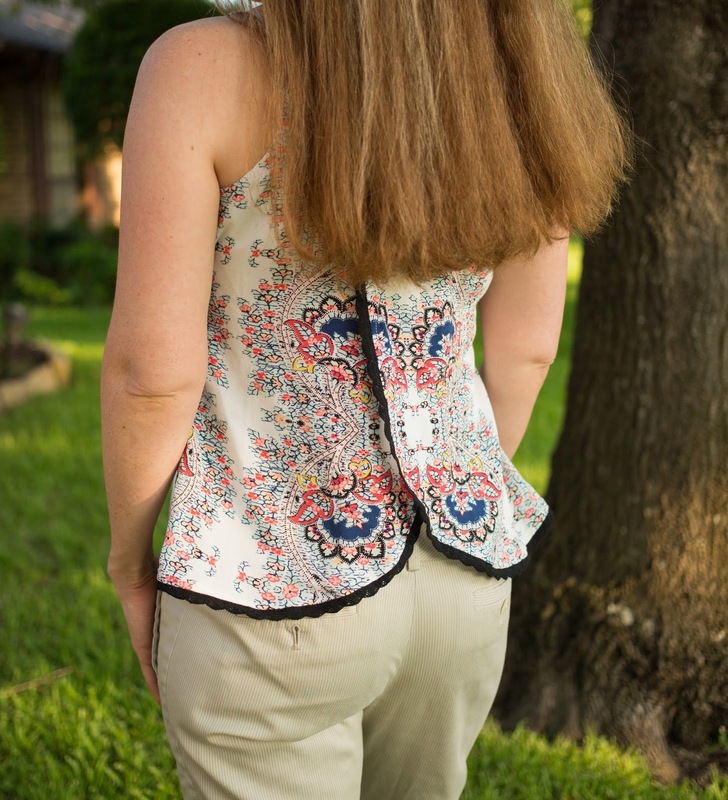 The back of the Crystal Cove Cami is two pieces that overlap and feels so airy. This back style also makes it much easier to pull the top up for breastfeeding. In a more fitted woven top, it is rather difficult to pull the top up to nurse so I feel like I get the best of both worlds - a nicely fitting cami with a back that allows ease to pull up for nursing. Fabric. 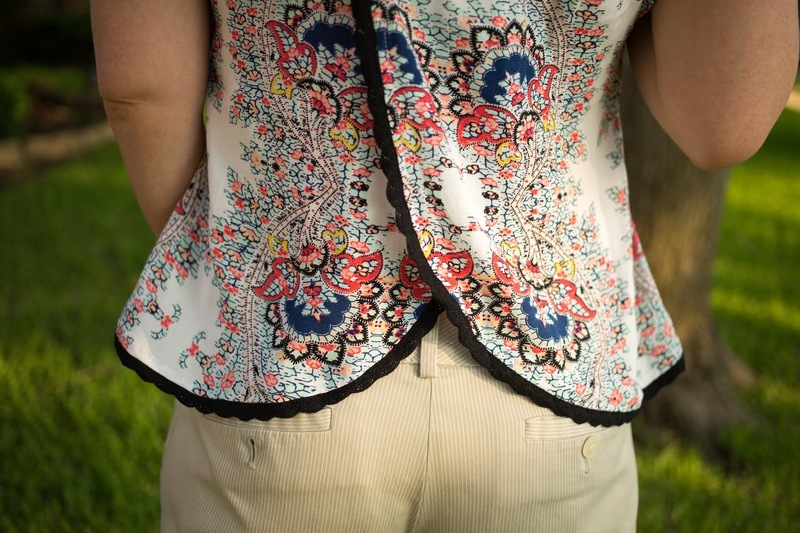 A lightweight woven works great for this cami pattern. I used a rayon gauze for this vertically striped red top. I had a remnant that was barely 3/4 of a yard that I could not pass up in the Dallas Fabric District. It was super soft, and I just could not put it down despite it being such a small amount of fabric. I had it in my fabric stash for some time and still had not found a good use for it because most top patterns, even tanks, need a yard. This cami does not take a lot of fabric since the straps are a separate small pattern piece so it was perfect for that remnant. I am so glad I had it! When I took these photos, there was a perfect breeze blowing on the walking trail near my house that day. I loved the movement it gave to the shirt without me feeling like I was going to have a wardrobe malfunction. It was such a beautiful evening that I even saw a guy carrying around a glass of wine meandering around the trails and looking rather relaxed. My 9 year old daughter, who joined me to take the photos, excitedly chatted away with me. My 7 year old, on the other hand, immediately was bored and needed to go to the restroom so we had to be quick! Ha! Details. The curved narrow hem. Perfectly placed darts. Understitched yolk. Delicious. I feel like a baker describing cake! Kennis, the designer behind Itch to Stitch, always has the easiest to follow instructions that give you such beautiful hand-sewn garments. Sizing and adjustments: This pattern works for bust sizes from 30 to 49 inches and cup sizes A to DD. I made a size 0 for my bust and waist and graded to a 2 for my hips. I made a D cup because I currently have a 4 inch difference in my over bust and full bust. The sizing was spot on for me! If you have read my blog for very long, you know I cannot just stop at one on patterns that I love, so of course I have another top to show you. This next top was supposed to be my muslin to check fit, but it came out great without needing any adjustments. Complete win! Fabric: I used a rayon crepe on this one. I used a trim to hem this top as Kennis suggested in the instructions. I love how the contrast came out and how easy it was to do. I feel like the trim does not have the same drape as the fabric, though, so it did feel stiffer on the sides than my other top. I still LOVE the way it came out and will get a bunch of wear out of this one. One thing you may notice is that BOTH of my bottoms that I am wearing in my photos were not made by me! This is another big hole in my handmade wardrobe that I need to work on ASAP. I think I have always felt more intimidated with fitting pants, especially since my waistline and hips have changed so much in the past due to pregnancy. Now that I am back to my normal measurements again, I need to tackle more bottoms and replicate some of my favorite ready to wear bottoms. You can purchase the Itch to Stitch Crystal Cove Came here. 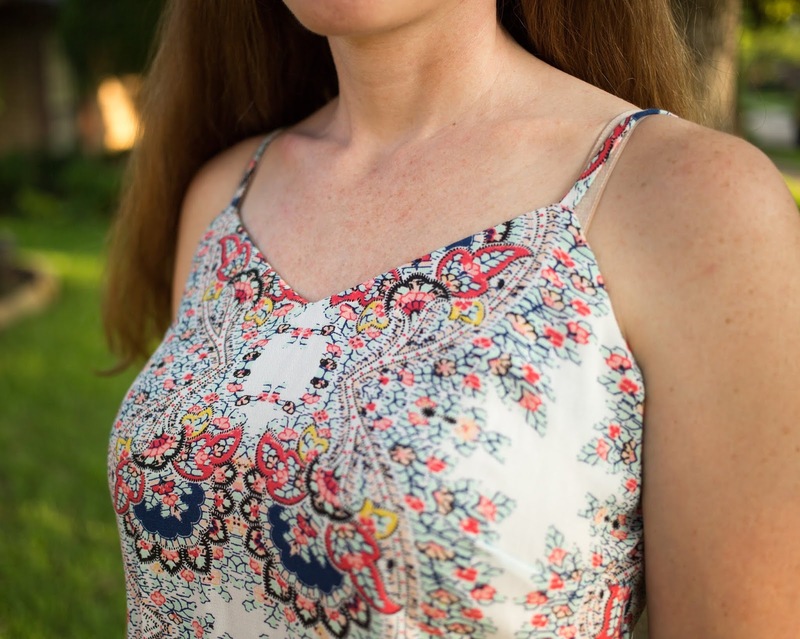 Thank you for stopping by and taking the time to read my blog. I hope I have inspired you and can't wait to see the versions you make out of this pattern. Disclosures: I received the rayon crepe fabric as a gift from my sweet, sweet friend Aimee Wilson, who also was the photographer of the rayon crepe top! Also, I received the cami pattern for free as part of the testing process to give the designer feedback about the instructions and fit of the pattern. Moreover, this post may contain affiliate links, which means I receive a small compensation when you purchase via my link. There is no cost to you. Any and all opinions expressed are my own.